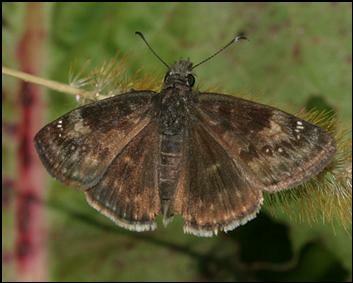 Not until 1936 was Wild Indigo Duskywing described as a species separate from Persius Duskywing (Forbes 1936). But Thaddeus W. Harris was probably referring to this duskywing in his 1862 report, when, at the end of a section on Juvenal’s Duskywing, he writes: “There is a local variety of this skipper, that is much more common in Massachusetts than the preceding, of inferior size, seldom expanding more than 1.4 inch, in which the white spots are smaller, and the seventh is wanting near the middle of the fore wing. This skipper is found in meadows in May and again in August. The caterpillar lives on various pea-blossomed plants...” (1862: 309). The smaller size compared to Juvenal’s, the second flight in August, and the use of legumes as hosts are a cluster of characteristics suggesting Wild Indigo Duskywing. To Scudder they suggested Persius Duskywing, but we now know that Persius does not have a second brood. Horace’s Duskywing does have two broods, but is a scrub oak feeder, and is not smaller than Juvenals; Dreamy and Sleepy Duskywings have no subapical white spots. Until the Wild Indigo Duskywing was formally described by William T. Forbes in 1936, lepidopterists included it, Persius Duskywing (Erynnis persius), and sometimes even Columbine Duskywing (Erynnis lucilius), under the heading “persius.” These three duskywings are difficult to distinguish even today and are sometimes referred to as the “persius complex”. Thus Scudder’s discussion of “Persius Duskywing” in New England does not tell us much, because it does not distinguish between the Wild Indigo and the true Persius. But re-determinations of old specimens have demonstrated that Wild Indigo Duskywing was present in eastern Massachusetts and in Deerfield in the late 19th century. In 1940 W. T. Forbes examined three F. H. Sprague specimens in the Harvard MCZ, which were originally labelled as E. persius, and re-determined them as E. baptisiae. These specimens confirm that Wild Indigo Duskywing was present in Wollaston on July 24 and August 23, 1883, and in Belchertown July 15, 1878. In 1964, J. M. Burns re-examined an August 18, 1883 MCZ Sprague specimen from Deerfield, Massachusetts, and likewise determined that it was a Wild Indigo Duskywing. Samuel Scudder had used a Guildford, Conn. specimen, collected by Smyth prior to 1889, as a model for a female Horace's Duskywing (Pl. 9 fig. 7, BNE 1899); that specimen, too, has since been determined to be actually a Wild Indigo Duskywing. It is perhaps surprising that more of the late 19th century duskywing specimens in the MCZ are not Wild Indigos. A good number of specimens from Wollaston (1883, 1895, 1897), Wellesley(1890) and Waltham (1897) have been re-determined (some by J. M. Burns) to be actually persius or lucilius, as they were originally marked. Hence the conclusion that those two duskywings, Persius and Columbine, have declined drastically since then, and that Wild Indigo has increased. Museum specimens which date from later than 1936 are usually reliable. Wild Indigo Duskywing was found in 1939, 1941 and 1942 in Fall River (Bliffin’s Beach), Somerset, and Westport by W. P. Rogers; his specimens are mostly from May and July, but one from 20 Sept. 1939 documents three broods that year in that area (Yale Peabody Museum). In 1950 and 1952, Wild Indigo Duskywing was collected in Barnstable by C. P. Kimball (MCZ). In 1966 it was collected in Concord at Walden Pond Reserve by C. G. Oliver; in the 1970’s at Falmouth Wood’s Hole, Plymouth Halfway Pond Road, and Dover by L. F. Gall; and in 1985 and 1986 in Wellesley Babson College and Medford Middlesex Fells by D. F. Schweitzer (Yale Peabody Museum). In 1973, 1974 and 1977 it was found in Westwood, Dover, West Medway, and Medfield Junction by W. D. Winter; Winter also raised it at his home in Dedham on Baptisia tinctoria (specimens in MCZ). In the 1930's and 1940's, F. M. Jones and Charles Kimball documented Wild Indigo Duskywing from Martha's Vineyard and Nantucket, also deducing two broods on the islands. Jones reported that adults were often common about wild indigo (Baptisia) plants on the Vineyard, especially in the Plains area, and that larvae were found on this plant in August. Nine of Jones’ specimens are in the Yale Peabody Museum; one is dated 15 August 1939, illustrating the second flight. On Nantucket there were also two broods, with Charles Kimball reporting that it was occasionally seen in mid-May, but was very common in July and August in the vicinity of its host plant (Jones and Kimball 1943). There is at least one specimen (n.d.) in the Maria Mitchell Museum on Nantucket. Because of the presumed drastic decline in Persius Duskywing in Massachusetts, and the probable extirpation of Columbine Duskywing, the vast majority of small duskywings with white subapical forewing spots seen in the field today are Wild Indigo Duskywings. Persius and Columbine cannot be reliably distiguished from Wild Indigo except through expert dissection of a specimen. But important and suggestive field marks are summarized in Cech and Tudor 2005 and other sources. This duskywing is named for its host plant, the native wild indigo (Baptisia tinctoria), which was probably quite common in the 19th century in eastern Massachusetts. Mrs. William Starr Dana of Boston and New York wrote in 1893 that “This rather bushy-looking, bright-flowered plant is constantly encountered in our rambles throughout the somewhat dry and sandy parts of the country in midsummer (1898 printing, p. 170). There are 25 references to this plant in Thoreau’s Concord journals (Angelo 1984: 104). Thoreau describes how the stems and seeds, turned black in the fall, are blown about in the wind like tumbleweeds, and thus very well dispersed. Wild Indigo Duskywing also utilizes wild lupine (Lupinus perennis) and crown vetch (Coronilla varia) in our area. The 1995-99 Connecticut Atlas found larvae on all three of these host plants (O’Donnell et al. 2007). However, wild lupine is not found today (and probably was not historically) in the wild in eastern Massachusetts, and there are very few locations for it in western Massachusetts. Not surprisingly, Wild Indigo Duskywing’s use of that plant here has not been reported. Wild Indigo Duskywing has become the poster-butterfly for the benefits of “switching” to a new, more widespread host plant, in this case crown vetch, a non-native hybrid variety introduced for erosion control along roadsides. Wild Indigo is thus among the surprisingly large number of butterfly species which have successfully adapted to a non-native larval host plant (Table 3 “Switchers"). Shapiro (1979) was the first to demonstrate that this species could utilize crown vetch. Many writers (e.g. Gochfeld and Burger 1997:226 for New Jersey; Shapiro 1979 for southeastern Pennsylvania; Iftner et al.1992 for Ohio) report a substantial increase in the numbers of Wild Indigo Duskywings coincident with the planting of crown vetch along highways and dams, to prevent erosion, beginning in the 1960’s. For Ohio, Iftner et al. reported in 1992 that “Although this skipper probably still uses Baptisia in certain prairie areas, it now appears to be using crown vetch as the primary foodplant throughout most of Ohio. It is becoming one of our most common skippers” (1992: 38). In Connecticut the Wild Indigo Duskywing is common and widespread today, but was less so previously, at least in part due to the roadside planting of crown vetch. At the time of the 1995-99 Atlas, the number of project-period records, 171, compared to pre-project records of only 37 (O'Donnell et al. 2007). The same increase probably took place in Massachusetts (Table 2). In Massachusetts, observers have reported Wild Indigo Duskywing from many areas with Baptisia present, but no known crown vetch (for example the Lamson Rd. water department property in Foxboro), but also from areas with large drifts of crown vetch and no known Baptisia, such as Delaney WMA in Stow. Mello and Hansen (2004) report both host plants for Cape Cod. Wild Indigo Duskywing will also oviposit on non-native Baptisia australis in gardens. A photograph of a Wild Indigo Duskywing egg laid on this plant on 8/2/2013, in the yard of Elise Barry in Paxton may be seen at http://garrykessler.zenfolio.com/p232585382/h679ed3d1#h679ed3d1 The photo is by Garry Kessler. Wild Indigo Duskywing also uses native eastern red columbine (Aquileqia canadensis) in garden situations (Pavulaan, cited by Schweitzer in MAS Atlas account). Both these plants are apparently viable hosts, although more formal tests of larval growth and survival might be desirable. Wild Indigo Duskywing is no longer confined to dry, sandy barrens, but is adapting to many open-space habitats owing to the use of new larval hosts (Cech 2005). MBC records 2000-2007 rank Wild Indigo Duskywing as Uncommon-to-Common compared to all butterfly species occurring in the state (Table 5). The most common duskywing, Juvenal’s Duskywing, is about three times more likely to be seen than Wild Indigo, but Wild Indigo is the second most common duskywing, and Dreamy Duskywing the third most common. Horace’s and Sleepy Duskywings are in the Uncommon range. The 1986-90 MAS Atlas found Wild Indigo Duskywing in only 45 out of 723 blocs searched; it was actually found less frequently than Dreamy Duskywing (92/723 blocs). New analyses suggest that Dreamy Duskywing has been decreasing in numbers in recent years, while Wild Indigo Duskywing has been increasing. An important list-length analysis of 1992-2010 MBC records found a statistically significant 53.1% decrease in Dreamy Duskywing, and a small, non-significant increase of 21% in Wild Indigo Duskywing (G. Breed, S. Stichter, and E. Crone, 2012). Chart 81 also shows an overall pattern of increase in this species from the early 1990’s until 2009. The unadjusted totals of numbers seen also show strong upward movement over this time period, and linear regression of the data also shows a small upward slope (R²=0.115). The moving average in Chart 81 shows a fluctuating pattern, of low sightings per trip 1992 through 1995, higher numbers 1996 through 1999, a drop in 2000 through 2004, and rising sightings per trip again from 2005 through 2009. These 3 to 4 year fluctuations are somewhat similar to the pattern for Juvenal’s Duskywing. In 1991-2013 BOM- MBC records, Wild Indigo Duskywing was found in 126 out of a possible 351 towns in Massachusetts, slightly more than the 94 towns in which Dreamy Duskywing was found, but fewer than the 166 towns in which Juvenal’s Duskywing was found. No map is available for this species. BOM-MBC 1991-2013 records now show that Wild Indigo Duskywing is found not only in east and central Massachusetts, but fairly commonly throughout the Connecticut River valley. It is still uncommon to rare in Berkshire County. Berkshire County: Wild Indigo Duskywing has not been normally found on any of the three Berkshire County NABA Counts, all held every year 1993-2013. In these 20 years it has never been reported from the North Berkshire Count, and there are no credible reports from north Berkshire towns. In these years it has only been reported once on the South Berkshire Count, 1 in 2008, and there is one report of a single from the lower-elevation town of Sandisfield in 2007. The Central Berkshire Count has three reports in these years, 1 in 1992 (netted to confirm identity), and 4 on 7/21/2012 and 7/20/2013, at Pleasant Valley WS, B. Benner et al.. There are also two other reports from the central Berkshires: Hinsdale, 2, 8/11/2013, T. Armata; and Lee October Mtn. SF, 3 on 9/6/2004, S. Moore and B. Volkle. These two reports are in August and September, and no other duskywing flies that late. It appears that Wild Indigo Duskywing is now present in small numbers in the central Berkshires. There were no reports at all in the 1990's. Franklin County: Wild Indigo Dusky has occasionally been found on the Central Franklin NABA Count -- 5 times in 23 years, in small numbers. There are also three reports from towns in this county: Montague (1, 9/4/2010, M. Fairbrother), Gill (6, 6/12/1999, D. Small), and Deerfield (15 on 6/4/1996, D. Potter). Central and southern Connecticut River valley (Hampshire/Hampden Co.): In contrast to the Berkshires, Wild Indigo Duskywing is normally found on the Northampton NABA Count, begun in 2001, the highest numbers being 20 on 7/21/ 2013 and 16 on 7/23/2006. There are also many other reports from towns in this count area, such as Northampton (many reports; see below), Amherst, Holyoke and Sunderland. In the southern Connecticut River valley, Wild Indigo Duskywing was well-reported from Springfield (Lower Pioneer Valley NABA Count) in 1990 (7), 1995(7) 1999 (16) and 2008 (6) by R. Pease, and there are reports of singles from Hampden in 1995 and Westfield in 1998 and 2000. Worcester County: Wild Indigo Duskywing is usually, but not always reported from the Northern Worcester County NABA Count, and not in large numbers. It is found more frequently and in larger numbers on the Blackstone Valley (southern Worcester County) NABA count, the largest report being 25 on 7/13/2008. Martha's Vineyard and Nantucket: Wild Indigo Duskywing is common on the Vineyard (Pelikan 2002), and MBC has many records. It is usually reported on the Vineyard NABA Counts. Historically it was also reported as common (see above). On Nantucket, it had been historically reported as common by Kimball, and B. Cassie re-confirmed it during the Atlas period, finding it on 8/11 and 8/12/1988. There are no BOM-MBC reports, but local observers believe that it is probably still a breeding resident (LoPresti 2011). Locations which have provided the highest numbers of Wild Indigo Duskywings are below. All but Northampton and Springfield are in eastern or central Massachusetts. Acton Fort Pond Brook, 11 on 7/21/2002, E. Nielsen; Barnstable Marstons Mills Airport max. 12 on 7/31/2010 A. Robb et al. ; Boston W. Roxbury Millennium Park max. 25 on 8/4/2009 B. Bowker; Boxford/Georgetown power line max 36 on 7/29/2008 S. and J. Stichter; Canton Great Blue Hill, max. 25 on 7/31/2003, T. Murray; Chelmsford power line, Concord Road section, max. 25 on 7/30/2011, B. Bowker; Chilmark Peaked Hill, 9 on 8/11/2001, M. Pelikan; Concord NABA (incl. Acton) 42 on 7/13/2013; Falmouth Crane WMA max. 27 on 8/4/2000, A. Robb; Foxborough Lamson Road, max. 15 on 6/6/2011, M. Champagne; Framingham Callahan SP, max 28 on 7/15/2008 B. Bowker; Holliston Brentwood CA, max 24 on 5/31/2009, B. Bowker; New Bedford Plainville Road, max. 10 on 7/23/2011, M. Mello; Newbury Martin Burns WMA, max. 32 on 7/22/2008, S. and J. Stichter; North Andover Weir Hill TTOR, max. 12 on 7/15/2010; Northborough Carney Reservation, max. 20 on 7/17/2010 S. Moore and B. Volkle; Northampton community gardens, many reports, max. 18 on 8/11/2007, E. Nielsen; Plymouth Myles Standish SF, max. 5 on 5/26/2007, Murray/Nielsen/MBC; Raynham Borden Colony, 10 on 7/9/2012, J. Dwelly; Sherborn power line, max. 25 on 7/30/2011, B. Bowker; Springfield, 6, Lower Pioneer NABA 7/17/2008 R. Pease; Stow Delaney WMA, max. 50 on 5/19/2012, T. Murray et al. ; Waltham Prospect Hill max 15 on 7/29/2008 J. Forbes; and Worcester Broad Meadow Brook WS, max. 20 on 7/29/2001 G. Howe. The MBC 1993-2008 flight chart (http://www.naba.org/chapters/nabambc/flight-dates-chart.asp) for Wild Indigo Duskywing shows it on the wing from late April through mid-October. Two broods are quite apparent, and the fairly large number of sightings through September and into October strongly suggests a partial third brood (see September photo above). Earliest sightings: In the 23 years of BOM-MBC records 1991-2013, the five earliest "first sightings" are 4/16/2000 Westfield Barnes Airport, T. Gagnon; 4/20/2010 Woburn Horn Pond Mountain, M. Arey; 4/21/2012 Medford Middlesex Fells, M. Arey; 4/25/2013 Dartmouth Allens Pond, L. Miller-Donnelly; and 4/26/1995 Foxborough, B. Cassie (previously cited in the MAS Atlas as the early date). The influence of the particularly warm springs of 2012 and 2010 can be seen here. These early dates all occur in 2000 or later, suggesting some advancement in emergence time over the past 25 years. In seven, or about about one-third of the years, the first sighting of a Wild Indigo Duskywing occurred in the last week of April. In two other years, the first sighting was in the first week of May; the remaining first sightings were later. Latest sightings: In the same 23 years under review, the six latest "last sighting" dates are 10/17/2008 Belmont, F. Bouchard; 10/16/1998 Northampton community gardens, T. Gagnon; 10/15/2002 Northampton community gardens, T. Gagnon; 10/13/1997 Holyoke, R. Pease; 10/11/2013 Northampton community gardens, T. Gagnon; and 10/10/2010 Beverly community gardens, K. Haley. The 1986-90 Atlas late date had been 9/29/1994 in Wellesley, R. Forster; all these dates are later. This species has been seen flying into October in 11, or about half, of these 23 years. Two of these 11 years were in the 1990's -- 1997 and 1998. All the September and October fliers are likely third-brood individuals. 2011 did not produce any third-brood sightings, the flight seeming to end at the end of August, but 2012 saw many September individuals, the latest sighting being one on 10/6/2012, in Waltham, photographed by J. Forbes and identified by F. Model. It is difficult to determine exactly when the second and third broods emerge, since there seem to be some Wild Indigo Duskywings flying at all times on a statewide level. The 1993-2008 MBC flight chart shows a peak in sightings in the last week of May and first week of June, and a second peak in late July and early August. Schweitzer reported fresh second brood adults flying as early as the last week of June at Middlesex Fells in the 1980’s (MAS Atlas). In Connecticut, the 1995-99 Atlas reported three broods, the third flying late August-late September (O’Donnell et al. 2007). One hundred years ago, Scudder’s latest date for the well-studied “Persius” (his sample most probably consisting mostly of Wild Indigos) was a very worn individual from Waltham, Massachusetts from August 26 (1899: 1474). So there may have been some lengthening of the flight period in the last 100 years, either by longer-flying “second brood” individuals or more probably by the addition of a third brood. Scudder had only “scant records” of even a second brood, but in fact they are rather persuasive records. “Sprague reports several fresh specimens captured in the vicinity of Boston between July 18 and 27; I have myself seen (but not taken) what I judge to be the same, in a fresh condition at Waltham on August 3rd, and in the same place a very rubbed specimen probably to be referred to this species on August 26;...” (1899: 1474). If these had been what we now call Persius Duskywings, the flight would have been finished by mid-June. Wild Indigo Duskywing is an adaptable species which is found throughout most of eastern North America, from southwest Ontario and southern Minnesota to central Texas and northern Florida. Wild Indigo Duskywing appears able to re-colonize new plantings of crown vetch with some ease, so that local extinctions may be balanced with new occurrences. The species occurs in uncommon ‘barrens’ habitats, but also adapts to previously disturbed areas. Climate warming should not drastically affect the status of this species in Massachusetts, but may allow it to have a larger third brood and to move further north in northern New England.